Elbow pain is extremely common and will affect most people at some point in their life. While pain in the elbow is rarely a sign of a serious condition it often is the cause of extreme pain and discomfort. Pain in the elbow will normally affect a person from performing their normal tasks and activities and therefore it should be treated as soon as possible. Below we shall discuss the most common causes of elbow pain and look how you may begin your journey to become PAIN FREE 100% naturally without drugs or steroids. Is elbow pain keeping you awake at nights… affecting your performance at work…. Stopping you from exercising or visiting the gym… or maybe the pain is just draining you mentally and physically? Did you know that you are probably just as likely to suffer from elbow pain if you where a 21 year old then if you where a 65 year old? That’s because elbow pain can affect anyone regardless of their age or health and will often be a result of a sudden impact injury, repetitive stress or constant strain to the area. Before your elbow pain were you able to rest your elbows on a desk or hard surface comfortably, could you wear long sleeve clothing without any fear of pain or maybe you were able to do certain tasks without the constant fear of further injury? Regardless of whether you are a young active person that loves their sports, an office worker or tradesman that uses their arms all day or even a senior citizen that loves to garden… elbow pain is extremely troublesome when it occurs as it will generally limit or restrict any of these tasks or activities. Unfortunately many people make the mistake of trying to push through the pain…. resulting in additional injury and further pain. Are you feeling frustrated how long it is taking for your elbow pain to heal and you just want to return to your normal activities? It is normal to feel frustrated with any injury that affects your day to day activity. Pain in your elbow can be particularly frustrating as we need to use our arms for most tasks that we perform on a daily basis. This will often affect the ability for the elbow injury to properly heal. Did you know that by identifying if your elbow pain is acute or chronic you could actually help expedite the recovery? Your elbow pain onset could be either ‘sudden and acute’ or ‘slow and chronic’, by identifying which of these categories that your elbow pain falls into could be extremely beneficial in identifying and eliminating the cause. This information could dramatically expedite the recovery. As you are probably already aware elbow injuries can cause anything from mild discomfort to excruciating pain. Either way pain in the elbow should be treated as soon as possible in order to have the best chance for an expedited recovery. Have a read of the conditions listed below; these are the most common causes for pain in the elbow. After you identify your injury simply click on the associated link to discover more about the condition and some of the possible activities or causes that should be avoided to reduce the risk of further injury. We shall also discuss the existing treatment options… and see how the OSMO Patch, our 1oo% Natural treatment is able to help support the reduction of inflammation and the relief of pain caused by many of these common elbow injuries. To the right you may also wish to watch the video and learn exactly how the OSMO Patch works. Common Causes of Elbow Pain. Most causes of elbow pain will fall into three main categories: tendon tear or inflammation (bursitis or tendinitis), wear & tear or fracture. Bursae are small fluid filled sacs that act as cushions between the bones and overlying soft tissues. They help by reducing the friction between bones and muscle. Sudden impact to the elbow or overuse of the elbow may cause the bursa in the elbow to swell, inflame and sometimes tear. When this occurs the condition is known as elbow bursitis. Normal work and sporting activities can become difficult. Bursitis in the elbow is one of the most common causes of pain in the back of the elbow and may appear as a protruding lump. Bursitis in the elbow is also known as Olecranon Bursitis. For further information and to discover how the OSMO Patch can help relieve swelling and the associated pain due to medically diagnosed elbow bursitis simply click on the link below. Also known as Lateral Epicondylitis, Tennis Elbow will normally cause pain on the outer area of the elbow joint. Whilst the common name given to the injury is tennis elbow it is not necessary that a person needs to have been playing tennis to have acquired this injury. For further information and to discover how the OSMO Patch can help relieve swelling and the associated pain due to medically diagnosed tennis elbow simply click on the link below. Also know as Golfer’s Elbow. Medial epicondylitis will normally cause pain on the inner area of the elbow joint. Once again as with Tennis Elbow it is not necessary that a person needs to have played golf to have acquired this injury. 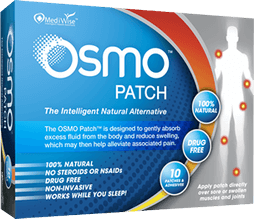 For further information and to discover how the OSMO Patch can help relieve swelling and the associated pain due to medically diagnosed medial epicondylitis simply click on the link below. Tendons are cords that connect the muscles and the bones. Injury and wearing of tendons around the elbow may cause considerable pain in the area surrounding the joint. Degenerative changes such as wear & tear can also result in tendonitis. For further information and to discover how the OSMO Patch can help relieve swelling and the associated pain due to medically diagnosed elbow endonitis simply click on the link below. Elbow pain can also be due to age related wear & tear. This can often lead to elbow bursitis as well as tendonitis of the elbow. Fractures and breaks in the elbow will usually cause extreme pain. Please consult your health care professional if you are experiencing this type of pain as such injuries need to be treated directly by a medical professional as soon as possible.